Microsoft has launched the first phase of its Skype Translator Preview, a program which aims to break down language barriers as it offers near-real-time automated voice translations through its Skype communication service. Skype says it has been breaking down geographical hurdles in audio and video communications for over a decade now. The new program shows the IM service's efforts in utilising innovations, including speech recognition and intelligent translation technology from Microsoft Research, to remove another barrier. Eventually Microsoft aims make it possible for any mix of people to communicate in their mother tongues, no matter what language they speak. 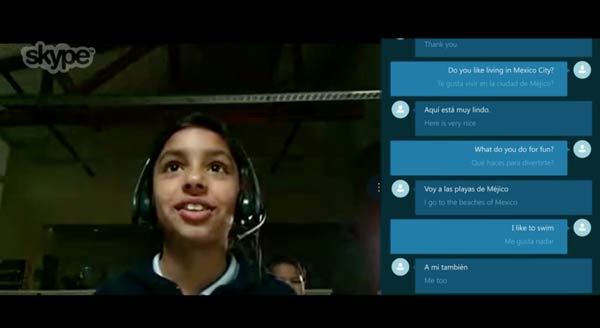 Skype Translator will allow users to have live voice conversations across different languages, where a computerised voice delivers the translation to the other user. A transcription is also displayed on-screen in a sidebar next to the main video chat window. You can see a demonstration in the video below. The first phase of the program will kick-off supporting just two spoken languages, Spanish and English - in addition to over 40 instant messaging text languages. However, to access the features, which will be available later this month, users will need an invitation. You can get on the invite list through Microsoft's Skype Translator Website. The program will also require a PC running either Windows 8.1 or the Windows 10 Technical Preview. Microsoft says that the technology behind Skype Translator is designed to learn from its users, so the more it is tested out, the more intelligent the program will become. The technology relies on machine learning to eliminate fillers like "um" which come up in natural conversations, and to distinguish differences between words such as "they're" and "their". The preview phase will help further refine the interpretations and translations. The team's long term goal is to incorporate as many languages as possible on as many platforms as possible. Those signing up will be asked to select their language preferences, and help shape the future of the project with their feedback. If it's as bad as all the online text based translators I can't see it being used very much. Hmm its difficult to define, maybe inaccurate. A lot of times I've typed out stuff using Google or sdl and people have just scratched their heads wondering what I'm trying to say. Basic phrases need to be worked on, along with sentence structure and using different words in different contexts. As a Spanish speaker, when I watch or read translations, they don't translate into what meant in English, but rather the literal meaning. Google translate does this often - it translates word by word rather than the whole thing. yes quite its more a literal word by word rather than the meaning of a phrase as a whole, which can potentially lead to some interesting miscommunication!